Facebook came out on top with over $600,000 in a research by PostBeyond that revealed how the tech companies listed in the Fortune 500 compare for profit made per employee. 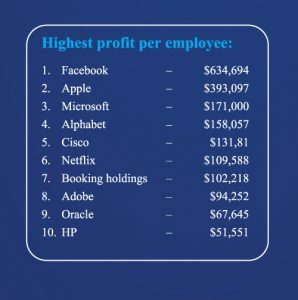 In the research conducted by PostBeyond, an online marketing company that specializes in selling over social and employer branding, Apple came in second with over $390,000 and Microsoft third with over $170,000 net profit per employee respectively. In 2017, Facebook was recorded to have 25,105 employees across the globe and that will only increase if their profits maintain their steady progression. Despite Facebook’s big lawsuit this year in regard to user privacy, they still have a total profit margin of $15,934 million which is a 5.9% increase from the previous year. Although Apple having a total profit of $48,351 million in 2017, their profit per employee averages out at just $393,097 and is down -0.19% since last year. Microsoft has a total profit of $21,204 million (less than half of Apple’s) and its profit per employee stands at $171,000. Despite ranking below Facebook and Apple, its percentage change from the previous year is 16.05%. The companies who have had the biggest percentage growth change from their previous year are NetApp (170.81%), Netflix (125.99%) and Amphenol (109.88%) – all of which combined have a total profit per employee of $169,277 million, just under Microsoft’s profit per employee total. PostBeyond’s research also showed that Dell, eBay and Motorola Solutions are also within the bottom Fortune 500 companies by having the lowest profit.